Pakistan again said on Saturday that it does not want a war with India, as the international community tried to defuse tensions between the nuclear-armed neighbours after Islamabad moved troops to the border. The United States and Russia led calls for calm in both Islamabad and New Delhi in a bid to improve ties that have deteriorated in the month since the Mumbai attacks, which India has blamed on Pakistan-based militants. “We have lost our people — we do not talk about war, we do not talk about vengeance,” Pakistani President Asif Ali Zardari said in a speech on the first anniversary of the assassination of his wife, former premier Benazir Bhutto. But Zardari warned India not to push Islamabad too hard for action against extremist groups like Lashkar-e-Taiba, which New Delhi says masterminded the attacks in Mumbai that left 172 people dead. “We have non-state actors. Yes, they are forcing an agenda on us,” the Pakistani leader said. Pakistan is financially bankrupt and living amid the turmoil of sectarian strife. Yet Islamabad commands a strong military that includes nuclear weapons. 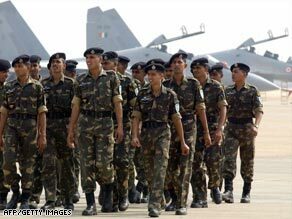 India also has a strong nuclear-capable military and, as the issue of Mumbai’s terror attacks has again proven, the hatreds between these two South Asian neighbors run deep…..
India and Pakistan have ratcheted up their rhetoric over last month’s Mumbai attacks, but analysts say a fourth war between the two nuclear-armed rivals remains unlikely. Tensions are nonetheless running high after India warned its nationals Friday it was unsafe to travel to Pakistan and Islambad canceled all army leave, leaving Washington to urge both sides not to increase tensions further. Another attack on India launched by Pakistan-based militants, however, could see New Delhi act decisively. – The Indian government faced widespread voter anger at the security and intelligence failures that led to the Mumbai attacks and must go to the polls by May. A strong response could see people rally behind it. The opposition BJP has made militant attacks a major campaign issue ahead of the general elections and has already indicated it would back the government if it chose to go to war. However, the BJP has also been criticized in some quarters for being opportunistic in making terrorism an election issue. India signed a landmark civilian nuclear cooperation deal with the United States earlier this year and might hope its growing political ties with Washington would get a further boost if it hit militant targets inside Pakistan with missiles and fighter jets. A senior military official says Pakistan has canceled leave for members of the armed forces because of tension with India following the deadly Mumbai attacks. The official spoke on condition of anonymity Friday because he was not authorized to talk to the media. India has said the gunmen who carried out last month’s attacks were Pakistani and had connections to the Pakistan-based terrorist group Lashkar-e-Taiba. Pakistan has demanded India share evidence of its allegations. Both countries have said they want to avoid conflict over the attacks, which killed more than 160 people. But India has not ruled out the use of force, and Pakistan has said it will respond to any attack and has placed its military on alert. India may consider “precision” strikes inside Pakistan-administered Kashmir if its neighbor doesn’t cooperate in controlling terrorists, a U.S. private intelligence company said. “Indian military operations against targets in Pakistan have in fact been prepared and await the signal to go forward,” Austin, Texas-based Stratfor said in a report today, without providing details of its source of information. Tensions between the nuclear-armed neighbors rose last month after terrorists killed 164 people in attacks targeting Mumbai’s main railway station, two five-star hotels, a Jewish center and a hospital. India blamed the attacks on “elements” in Pakistan, which then demanded evidence to support the accusation. India is unlikely to risk war by escalating the situation, an analyst said. India has threatened action and joined the U.S. to pressure Pakistan for action against all involved in the attacks, Stratfor said. It hasn’t repeated the military buildup that deployed 750,000 troops in Kashmir within a week after a terrorist attack on the nation’s Parliament in December 2001, Stratfor said. 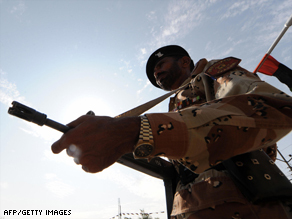 India put its Border Security Force on high alert on Dec. 18, Stratfor said. That force, which currently has 45,000 troops deployed along the 2,030-mile border with Pakistan, has a mandate to prevent infiltration and would not be involved in any combat operations, Stratfor said. One U.S. official said India’s air force “went on alert” after the attacks in Mumbai. Pakistani security forces took over a camp used by Lashkar-e-Taiba militants in Pakistani Kashmir on Sunday, a witness and an official from a charity linked to Lashkar said. The charity official said there were fighters there from Lashkar, the p”This happened this afternoon, security forces took over the camp,” said an official with Jamaat-ud-Dawa charity. A resident close to the camp on the outskirts of Muzaffarabad said he had seen security forces raid it. The charity official said there were fighters there from Lashkar, the prime suspect in the attacks on Mumbai last month that killed at least 171 people. rime suspect in the attacks on Mumbai last month that killed at least 171 people. Pakistani Islamists burn US and Indian flags during a protest in Lahore on December 5. Former US presidential candidate John McCain has said the devastating attacks in Mumbai must not be allowed to hinder the peace process between India and Pakistan. At least 171 people were killed during the three-day assault last month across Mumbai, India’s financial capital, which has imperiled the improving ties between the south Asian nuclear rivals.